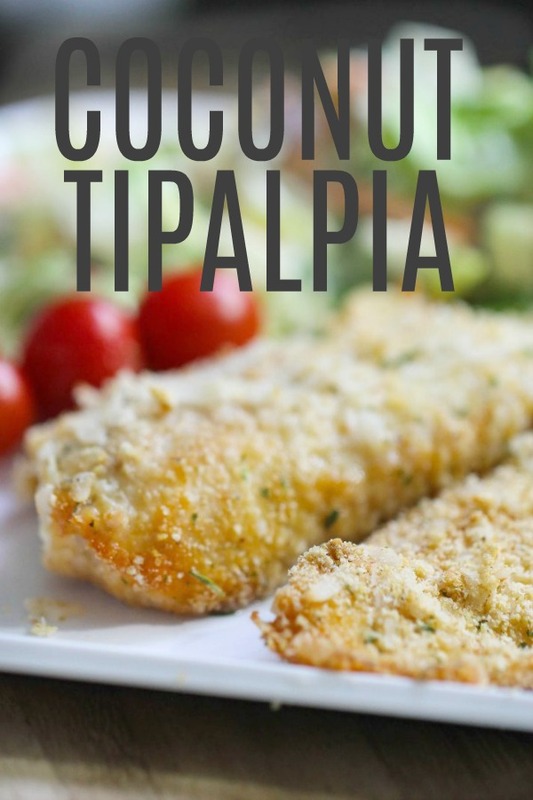 This Coconut Crusted Tilapia is simply delicious—tender fish with a tasty crust! If your family is tired of eating the same old thing, this tilapia is a great addition to your dinner menu. 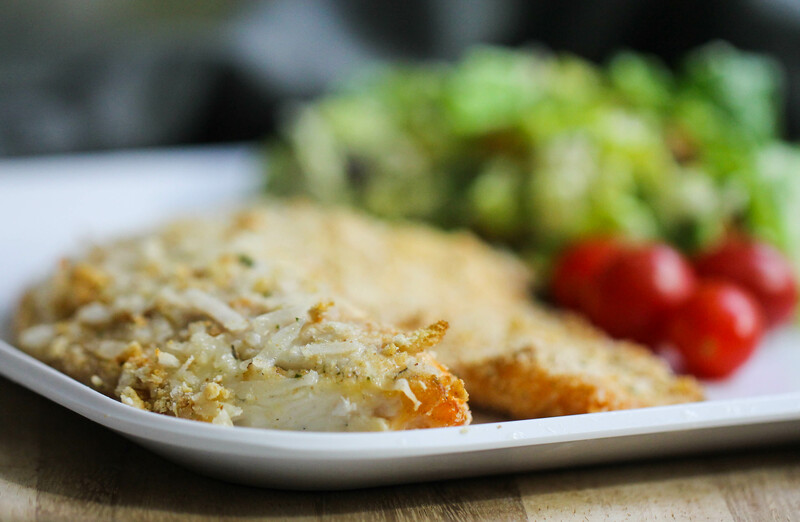 One of the things we like best about this Coconut Crusted Tilapia is how easy it is. With only five ingredients, it comes together quickly and satisfies everyone. 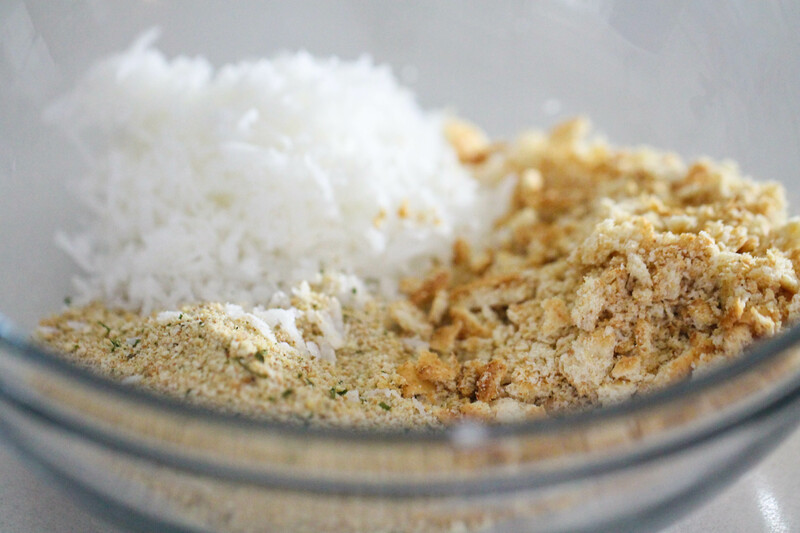 Next, combine the coconut, bread crumbs, and crushed crackers in a bowl. In a separate bowl, whisk your egg whites. 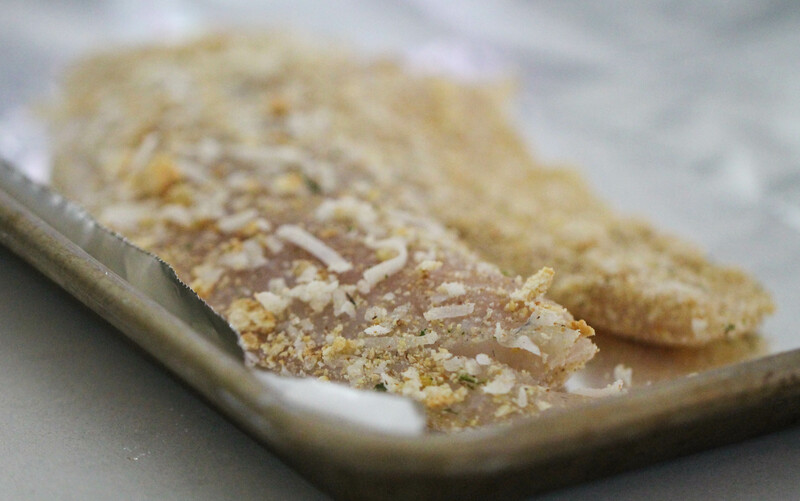 When you’ve got everything ready, dip each tilapia filet in the egg, then into the coconut crumb mixture. Coat the fish on both sides and then place them on your prepared baking sheet. Bake for 15-20 minutes. Check at 15 minutes to make sure it does not burn. The internal cooking temperature for fish should reach 145 degrees. Another easy way to know it is done is to stick a fork in it and twist. The fish should be opaque and should flake easily. What if we don’t like fish? Tilapia is a mild, white fish so it doesn’t taste as “fishy” as other types. Tilapia is low in fat and a good source of protein. It is full of healthy Omega-3s. Tilapia tends to be less expensive than other types of fish. 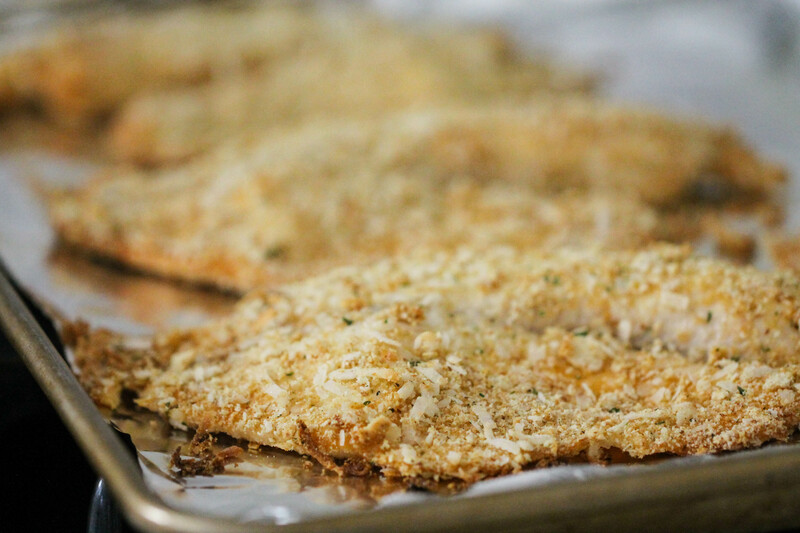 The crispy, coconut crust makes for a tasty fish that many fish skeptics love! You can’t go wrong with a Ziploc bag and a rolling pin. Add the crackers, remove the air from the bag, seal tight, and then roll (or bang) away with the rolling pin. Also, for the ¼ cup Ritz Crackers called for in this recipe, you’ll need about 6 crackers. If you need another recipe for those extra crackers, try our most famous recipe, Slow Cooker Ritz Chicken. We used sweetened coconut when we made this tasty dish, but plain, unsweetened coconut will work as well. We liked the hint of sweet it added to the dish, but make it according to your desired tastes or with whatever you have on hand. 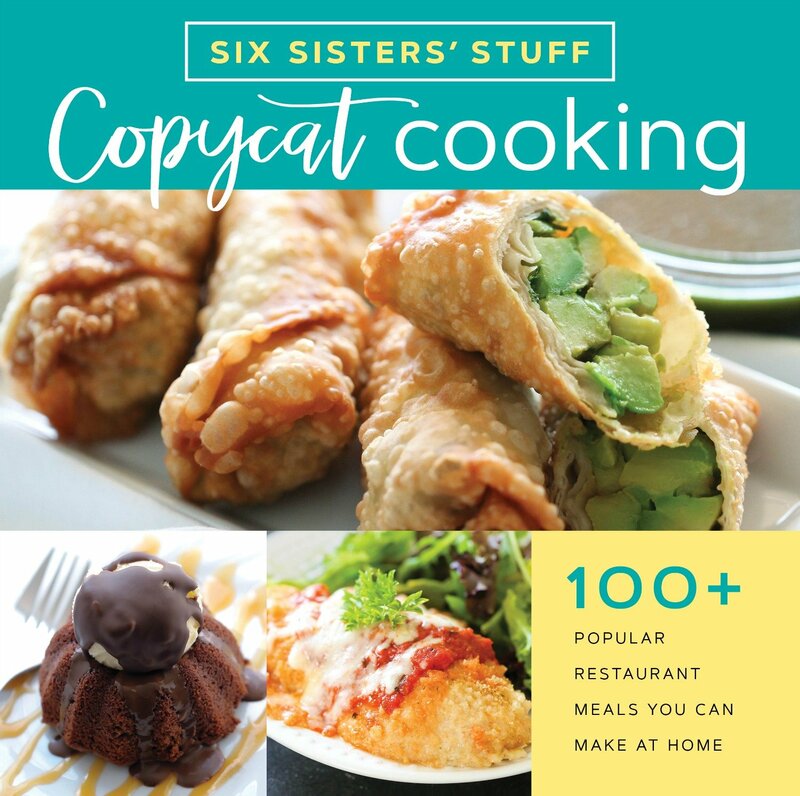 Looking for another great seafood recipe to add to your repertoire? Well you are in luck. Today on our Youtube Channel, we are showing you how to make Easy Baked Salmon and TWO Side Dishes baked together! Place foil on a baking sheet and spray with non-stick spray. Combine coconut, bread crumbs, and crackers in a bowl. Put egg whites in another bowl. Dip the tilapia in the egg, then in the coconut crumb mixture. Place them on the prepared baking sheet. We just tested it and it works fine. Hope you can get it to work on your computer. This was so easy to make! My family loved it. My son and dad are not coconut fans, so I didn't tell them what outside was until I noticed they ate everything on their plates! Thank you! I love tilapia (especially coming from Tanzania where it is so abundant!) and I use a lot of coconut in my cooking (again very Tanzanian) so I had to try this. I added a bit of garlic and some salt to the recipe too, and it came out amazing! Thanks so much for the inspiration! I love tilapia (especially coming from Tanzania where it is so abundant!) and use a lot of coconut in my cooking (again very Tanzanian) so I had to make this. I added a little bit of garlic and some salt too, and it was amazing! Thanks so much for the inspiration! Found this on pinterest. Had all the ingredients. Made it tonight and it was YUMMY! So easy. The coconut gave it just the right sweetness. What do you like to serve with this? I can't wait to try this. I have a question about the egg whites. Are they to be whipped before putting the fish in or just left as they are when coming out of the shell? Sounds delicious! Do you use sweetened coconut or the plain unsweetened coconut? Thank you! Either will work, but we usually use sweetened. Looks delicious! Thought you might like to know - there is a typo on your pin.